Thirty years in the making, The Parliament of Poets: An Epic Poem, by Frederick Glaysher, takes place partly on the moon, at the Apollo 11 landing site, the Sea of Tranquility. In a world of Quantum science, Apollo, the Greek god of poetry, calls all the poets of the nations, ancient and modern, East and West, to assemble on the moon to consult on the meaning of modernity. The Parliament of Poets sends the Persona on a Journey to the seven continents to learn from all of the spiritual and wisdom traditions of humankind. On Earth and on the moon, the poets teach him a new global, universal vision of life. All the great shades appear at the Apollo 11 landing site in the Sea of Tranquility: Homer and Virgil from Greek and Roman civilization; Dante, Spenser, and Milton hail from the Judeo-Christian West; Rumi, Attar, and Hafez step forward from Islam; Du Fu and Li Po, Basho and Zeami, step forth from China and Japan; the poets of the Bhagavad Gita and the Ramayana meet on that plain; griots from Africa; shamans from Indonesia and Australia; Murasaki Shikibu, Emily Dickinson, and Jane Austen, poets and seers of all Ages, bards, rhapsodes, troubadours, and minstrels, major and minor, hail across the halls of time and space. That transcendent Rose symbol of our age, the Earth itself, viewed from the heavens, one world with no visible boundaries, metaphor of the oneness of the human race, reflects its blue-green light into the blackness of the starry universe. 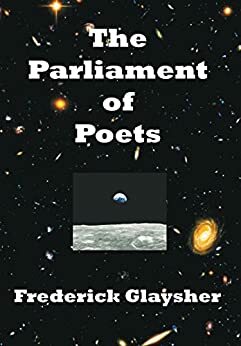 "The Parliament of Poets: An Epic Poem," by Frederick Glaysher, takes place partly on the moon, at the Apollo 11 landing site, the Sea of Tranquility. Apollo, the Greek god of poetry, calls all the poets of the nations, ancient and modern, East and West, to assemble on the moon to consult on the meaning of modern life. All the great shades appear at the Apollo 11 landing site in the Sea of Tranquility: Homer and Virgil from the Greek and Roman civilizations; Dante, Spenser, and Milton hail from the Judeo-Christian West; Rumi, Attar, and Hafez step forward from Islam; Du Fu and Li Po, Basho and Zeami, step forth from China and Japan; the poets of the Bhagavad Gita and the Ramayana meet on that plain; griots from Africa; shamans from Indonesia and Australia; Murasaki Shikibu, Emily Dickinson, and Jane Austen, poets and seers of all ages, bards, rhapsodes, troubadours, and minstrels, major and minor, hail across the halls of time and space. One of the major themes is the power of women and the female spirit across cultures. Another is the nature of science and scientism, as well as the two cultures. As the Guides show the Persona crucial sites around the globe, such as Chartres Cathedral and the temples of Asia, Angkor Wat and elsewhere, the nature of social order and civilization in the regions of the past is explored. Modern twentieth century historical experience in all its glory and all its brutal suffering is fully confronted. The modern movement toward a global civilization is recognized and celebrated for the unprecedented future it opens to human beings. That transcendent rose symbol of our age, the Earth itself viewed from the heavens, one world with no visible boundaries, metaphor of the oneness of the human race, reflects its blue-green light into the darkness of the starry universe. Wow !! This book is a great addition to my library, a read again and again book !!! Brilliant! Rarely now do I read a book in three days. This one I did. My mind and heart were fed. I sent copies to friends. This poem is an anodyne in the era of Trump. 7 pessoas acharam isso útil. A timeless cast of characters existing epically. Awesome is not a grand enough word to describe the timeless brilliance of these words. 5,0 de 5 estrelasAWESOME BOOK!! This was ordered as a gift and I have to admit I had a hard time letting it go! Highly recommend both the book and the seller!